Amazingly Dan Martin, who woke up feeling “much, much better” after his crash on Saturday, kept pace. 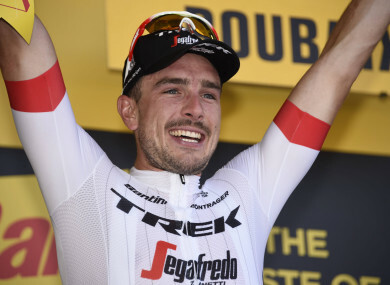 JOHN DEGENKOLB WON the Arras-Roubaix ninth stage of the Tour de France on Sunday ahead of Greg Van Avermaet as dozens of falls and multiple withdrawals made for a slapstick spectacle amidst clouds of dust. The win marks a return to form for the German, a former winner of Paris-Roubaix, who was knocked down by a car in Mallorca two years ago. Van Avermaet kept hold of the overall leader’s yellow jersey on a day when his team captain Richie Porte withdrew after a fall and the main contenders all finished more or less together. The lead trio broke with 15km to go and quickly agreed to cooperate taking turns at the head of the group to distance the peloton. The 155km stage featuring 22km of rough cobbled sections was expected to produce drama, and so it proved. Romain Bardet got a third flat tyre of the day and lost touch with the peloton with just 5km remaining as he exited the final section of cobbles. Chris Froome attacked at that moment and there will be increased bad will on the French roadsides for the British champion, who has been booed by sections of the public on this Tour. Miraculously Bardet made it back to the Froome group shortly before the finish line after a huge effort that saw the French hope gasping for breath. Questions will be asked about the leadership issue at Sky after Geraint Thomas abandoned Froome when a mechanical failure saw the four-time winner crash late on. On a mixed day for Spain’s Movistar team Alejandro Valverde gained a little time on his GC rivals, Nairo Quintana finished with the main group and Mikel Landa made a horrible error, falling off when reaching for a water bottle, losing time. Amazingly Ireland’s Dan Martin, who woke up feeling “much, much better” after his crash on Saturday, kept pace, as did Tom Dumoulin. The 155km stage featuring 22km of rough cobbled sections was expected to claim victims and thr first one had nothing to do with cobbles as Porte fell and looked to have broken his shoulder, leaving the race in tears after 10km. Winner in a spectacular style of the past two stages Dutch ace Dylan Groenewegen fell half way just around ste course, but was just one of dozens of rides to hit the floor. Email “Car crash victim Degenkolb back in business on Tour”. Feedback on “Car crash victim Degenkolb back in business on Tour”.